Notice: For the new version Tiny210V2SDK 1305, it will use the new name Smart210. The Tiny210V2SDK is a high-performance design based on the Samsung S5PV210 ARM Cortex-A8 microcontroller with 512MByte DDR2 RAM, 2GByte Nand Flash, RTC, Audio and Ethernet capability. The system consists of a motherboard with the CM-Tiny210V2 CPU module plugged into it, and an LCD touchscreen module mounted (three sizes available). The motherboard has integrated RS232, USB, Ethernet, Audio In/Out, Keyboard, LCD, HDMI, TV out, camera in, SDIO WiFi Module (pins only), SD card, G-Sensor and more other functions on board. A complete software development package is included. 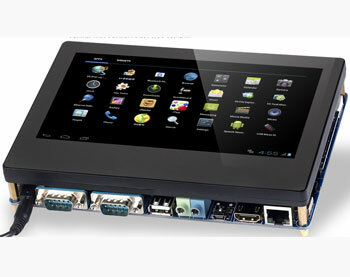 The board supports Linux 2.6.35 Android 4.0 and Android 2.3 operating system and is provided with complete basic drivers. We provide the Tiny210V2SDK mother board(new version: Tiny210V2 SDK 1301, For old verison, click here) for CM-Tiny210V2 CPU board. 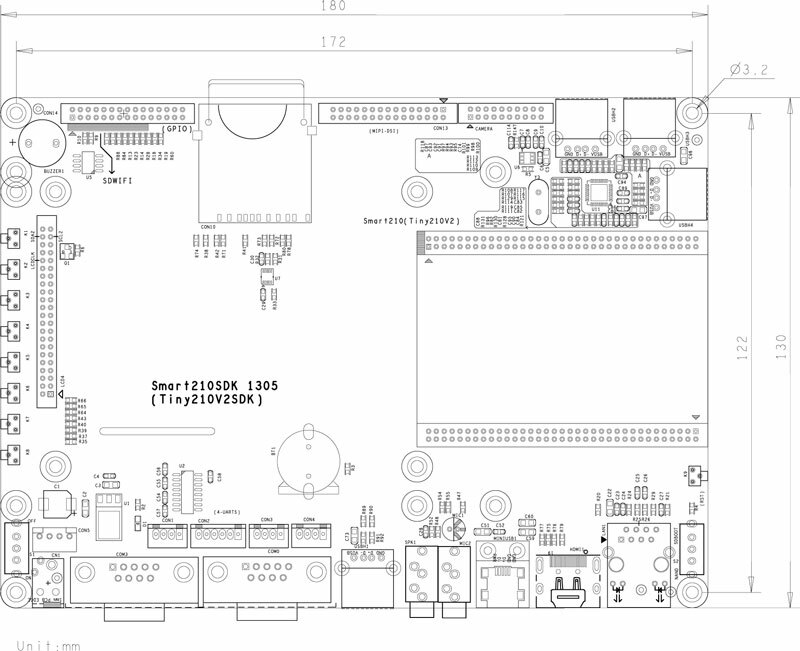 The board ships with Linux 2.6.28 BSP, WinCE BSP, and Android 2.3 Android 4.0 source code. CoreWind also offers customer design service based on the Tiny210V2-S5PV210 board according to customer’s requirement. Whether you need to reduce, add or modify to existing hardware, CoreWind will help customers with expert competence and rich experience.